CoffeeShop “Heart Family Tree” 8×10 Photo Storyboard! I love photo family trees, and when I was looking on Pixabay I saw this illustrated tree that would be perfect for a new storyboard! I wanted to use hearts so it could be used for Valentine’s Day, but you can also use it any other time of the year. It took forever to color each leaf and branch, but I had so much fun doing it and am so excited to hand it over to you! And like almost everything I create for my blog, you can use this commercially, no attribution necessary (just don’t sell it “as is”). I want you to make money off my freebies!!! When I first started out I didn’t have an extra penny to spend and I so appreciated all of the designers out there that posted free designs and decided once I had some experience I would do the same. Everything is customizable on this storyboard. It is 8×10 and can be printed, but you can also display it on the web. You can resize it bigger, but make sure to do this before adding any of your images. You can add any text in any font/color you want, and you can easily change the colors of the leaves and trunk of the tree. 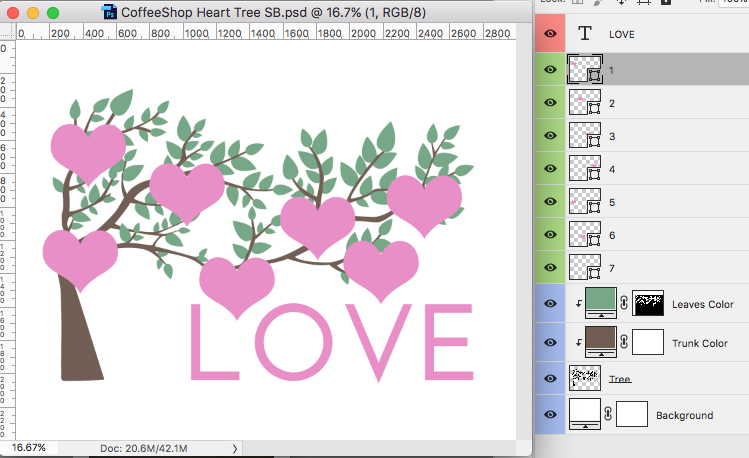 Download the CoffeeShop “Heart Family Tree” Photo Storyboard!